Patient response to cancer immunotherapies is currently reported as falling anywhere between 8% and 20%. Understanding the mechanisms by which tumors can evade the immune response and elucidating the complex dynamics of the tumor and its microenvironment are key to improving this success rate. ACE ImmunoID is designed to meet this need. 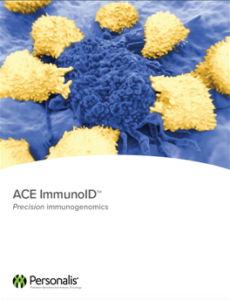 The ACE ImmunoID Platform integrates augmented exome and transcriptome sequencing from a paired tumor and normal sample to generate comprehensive genomic and transcriptomic data that can be used for neoantigen selection and tumor immunogenomic profiling. The result? A universal platform to support the development of more effective cancer immunotherapies by identifying biomarkers that can be used to stratify patient populations, determining rational therapy combinations, and developing truly personalized therapeutics.